What gets sprayed on the farm doesn't stay on the farm, suggests a new study that finds frogs living in mountains far away from agricultural fields are contaminated with a range of pesticides, particularly fungicides, used to protect crops from bugs, weeds and molds. "These fungicides have not been reported in the amphibians to date," study leader Kelly Smalling, a research hydrologist with the U.S. Geological Survey, told NBC News. 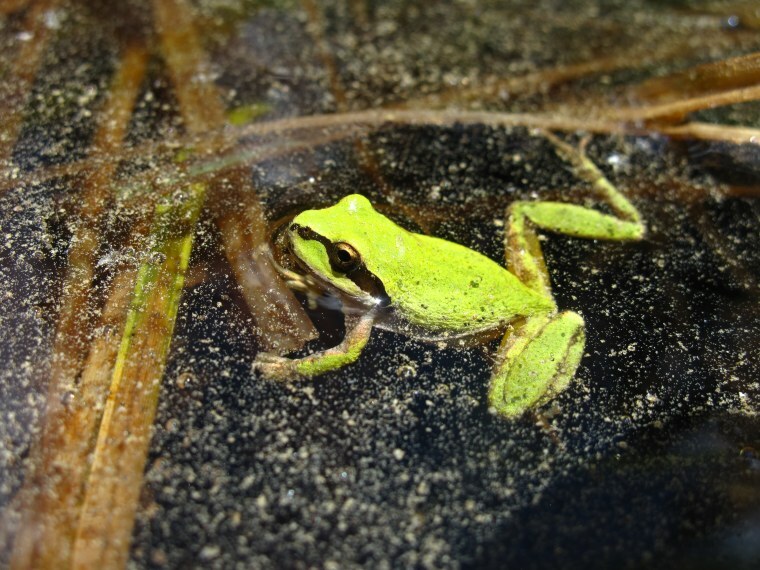 She and colleagues found the contaminated Pacific chorus frogs in California's Sierra Nevada, downwind from the Central Valley, one of the most productive agricultural regions in the United States. The impact of the fungicides on amphibian health are unknown, Smalling said, but scientists speculate they are among the multiple stressors "thought to be contributing to the decline of amphibians throughout California and throughout the United States." In particular, pesticides may depress the immune system of frogs, making them more susceptible to disease. Other stressors include habitat loss and invasive species. The pesticides were found in the frogs at trace amounts — measured in parts per billion — and lower than would be expected in amphibians living on a farm, noted Smalling. However, the compounds were in much higher levels in the frogs than in water and soil samples taken from the same remote mountain sites, which included the Lassen Volcanic National Park and the Giant Sequoia National Monument. That in and of itself is "one of the most important things that we found," Gary Fellers, a retired amphibian ecologist with the U.S. Geological Survey and study co-author, told NBC News. "What that means is the frogs are either bioaccumulating these compounds to the point that they could become toxic to the frogs or the frogs were exposed to much higher concentrations at one time when we were not there to do the environmental sample," he said. The fungicides pyraclostrobin and tebuconazole and the herbicide simazine were the most frequently detected compounds. "The follow up to this," Fellers said, "is we need to look at these in particular in exposure experiments and find out really how toxic they are to frogs." The study was published Friday in the journal Environmental Toxicology and Chemistry.